New electric-assist mountain bikes at Adventures on the Gorge allow riders to rest and ride. Imagine peddling less and riding faster. The new electric-assist mountain bikes at Adventures on the Gorge allow riders to do just that. The new powered bikes that are being used in the resort’s half-day Fat Kat Tours can maintain a top speed of 20 miles-an-hour on flat terrain, but they fly when the rider pedals, according to resort spokesman Dave Arnold. “Guests can let the bike do all the work, but the real fun begins when they pedal and combine human power with motor power,” Arnold says. 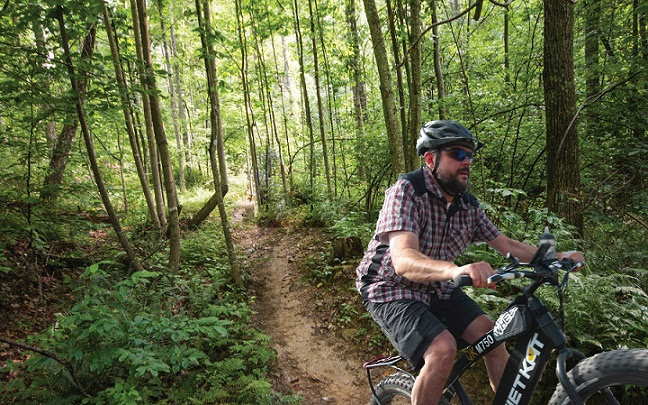 The tours meet at the resort’s rim campus on the verge of the New River Gorge before departing for a variety of local trails — gravel roads, jeep trails, rail-trails, and, possibly, non-technical single-track. With one guide for every four riders, groups learn quickly about the rides and equipment and take a short riding lesson. “Anyone who knows how to ride a regular bicycle can ride the Fat Kat,” Arnold said. The bicycles are manufactured by Quiet Kat of Eagle, Colo. The Fat Kat features fat mountain tires and a sealed mid-drive motor that provides five levels of assistance. A digital display allows for easy access to vital information, such as available battery life, distance, power control and speed, Arnold said. Rates are $64 per person for two-hour tours and $89 for half-day tours. Taxes and guide gratuities are not included. The minimum age is 16, and minimum height is 5-feet, four-inches tall. To book the Fat Kat and other adventures, call 1-855-379-8738.